I’m pondering the cosmic irony that suggests Thanksgiving and Christmas are times of peace and tranquility; especially when the two holidays collide like a comet into Jupiter. Whether your hobbies be altruistic, creating clever greeting cards, stitching needlepoint pillows resembling your friends pets, or – sigh – cooking, you barely get a breather before the next onslaught. I take full responsibility for my situation, having branded myself as someone who “loves to cook” many years ago. My family now associates the holidays with a galaxy of home-cooked specialties, lovingly made by yours truly. But when I started these traditions I was much younger – I had energy. Back then I poo-poo’ed help in the kitchen, wanting full control of my menu. In short, I created a monster and she’s penning these words. But this year I’m back in the saddle, grabbing the bull by the horns, reaching deep into my bag of tricks, way deep: I’m asking for assistance from my family. And I’m shoveling down, elbows into the soil, unearthing backwoods family recipes; down-home Alabama fare that deserve a facelift. As I riffled through recipes, my criteria is that it can be made well in advance, satisfies a wide girth of palates, and won’t break the bank in an economy that reeks to high heaven. And what did I pull out? Pimento Cheese. And here you’ll find her, all decked out for the holidays. I used the best sharp Cheddar I could find, substituted creme fraiche for mayo, roasted my own red peppers to use instead of bottled pimentos, and added bacon – the piece de resistance. 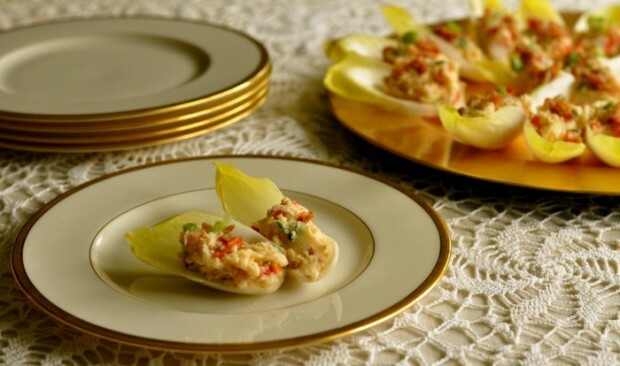 I served this in endive leaves but placing in a bowl and serving with crostini is a fine idea as well. Of course everyday Pimento Cheese would be delicious, too. *Creme Fraiche may also be made by whisking together equal parts of sour cream and heavy cream. Cover and let sit at room temperature, stirring once, 24 hours. Refrigerate until ready to use. Combine creme fraiche with diced roasted pepper. Stir in bacon, 1 tablespoon of bacon drippings (this added bit of fat may be omitted, but it sure is good! ), scallion and cheese. Season to taste with cayenne pepper. Combine well. Refrigerate 3 hours to allow flavors to combine. May be made, with the exception of scallions, up to three days prior to serving. Stir in scallions the day you plan to serve; best served at room temperature.